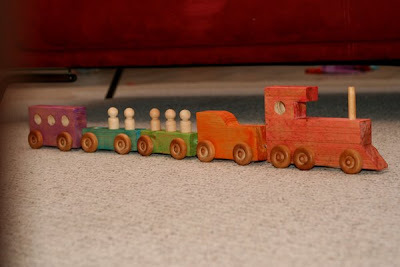 You know how we're an art family...: Choo-choo! I finally got around to painting Finn's newish train the other night. Painting the train didn't require much time or talent since I was just giving it a Waldorf finish of watercolor paint and beeswax polish, I just seemed to have difficulty finding even a little bit of time to tackle the project. 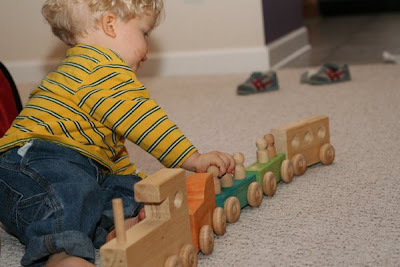 Then, of course, there was the matter of Finn stealing the train parts as I was trying to paint them. Finn and I were quite pleased with the result despite the fact he's labeled every piece "orange train".